The Daintree Rainforest in Queensland, Australia. A rainforest is a very dense, relatively warm, wet forest. Rainforests can be tropical, subtropical, and temperate forests. A tropical rainforest is one that lies between the Tropic of Cancer and the Tropic of Capricorn. A subtropical rainforest is one that lies immediately north or south of the tropics (north of the Tropic of Cancer and south of the Tropic of Capricorn) to about 35 degrees latitude. Air temperature in these forests rarely goes below freezing. A temperate rainforest is one that lies north or south of the subtropics and usually near the ocean, which moderates its climate. An exceptional diversity of life forms can be seen in rainforests, which hold most of the earth's species of plants and animals, each with their own peculiar shapes, structures, and functions. While it is a common misunderstanding that rainforests provide much of the world's oxygen (most rainforests do not yield much net oxygen, which is largely supplied by algae), they are vital in terms of biodiversity, climate regulation, sources of medicine, flood and soil loss prevention, and carbon dioxide absorption. Rainforests are characterized by high rainfall, with definitions setting minimum normal annual rainfall between 1.7 meters (about 5 1/2 feet) and 2 meters (about six 1/2 feet). Rainforests once covered about 14 percent of the Earth, but have been reduced in size now to only about 6 percent of the Earth's surface. Some estimate that tropical rainforests cover 12 percent of the land surface. Even though half the rainforests of the world are gone, some speculate that they still hold more than two-thirds of all plant and animal species on Earth. It has been estimated that many hundreds of millions of new species of plants, insects, and microorganisms are still undiscovered and as yet unnamed by science. Despite the extensive growth of flora in a rainforest, the actual quality of the soil is quite poor because high rainfall tends to leach out soluble nutrients. Rapid bacterial decay prevents the accumulation of humus. The undergrowth in a rainforest is restricted in many areas by the lack of sunlight at ground level. This makes it possible for people and other animals to walk through the forest. If the leaf canopy is destroyed or thinned for any reason, the ground beneath is soon colonized by a dense tangled growth of vines, shrubs, and small trees called jungle. Temperate rain forest in the Mount Hood Wilderness, Oregon, United States. This area, on the west side of the mountain, receives over 2.5 meters of rain per year. Temperate rainforests are coniferous or broadleaf forests that occur in the mid-latitudes in areas of high rainfall. While temperate forests in general cover a large part of the globe, temperate rainforests only occur in a few regions. Temperate rainforests can be found in western North America (British Columbia, southeastern Alaska, western Oregon and Washington, and northern California), the western Caucasus (Ajaria region of Georgia), the western Balkans, parts of Oceania (New Zealand, Tasmania, southeastern Australia), northwest Europe (British Isles and Norway), southern Chile, South Africa, and parts of Asia (Taiwan, and southern and western Japan). The temperate coniferous rain forests sustain the highest levels of biomass in any terrestrial ecosystem and are notable for trees of massive proportions, including redwoods and Douglas-fir. Temperate coniferous rainforests are quite rare, occurring in small areas of western North America, southwestern South America, and northern New Zealand. Olympic Peninsula. Temperate rain forests often grow right up to the shoreline. Rainfall: high rainfall (minimum 2 to 3 meters per year, depending on latitude), usually from moisture-laden winds off the ocean. 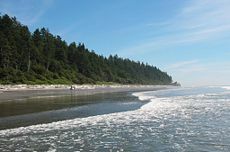 Proximity to the ocean: temperate rain forests depend on the proximity to the ocean to moderate seasonal variations in temperature, creating milder winters and cooler summers than continental-climate areas. 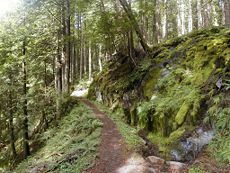 Many temperate rain forests have summer fogs that keep the forests cool and moist in the hottest months. Coastal mountains: temperate rain forests occur where mountains ranges are close to the coast; coastal mountains increase rainfall on the ocean-facing slopes. Tropical and subtropical rainforests are also known as tropical and subtropical moist broadleaf forests, and as tropical wet forests. They have also been called the "jewel of the earth," the "Earth's lungs," and even the "world's largest pharmacy" because of the large amount of natural medicines discovered there. Tropical and subtropical rainforests are found in a belt around the equator and in the humid subtropics, and are characterized by warm, humid climates with high year-round rainfall. Tropical and subtropical regions with lower rainfall, or distinct wet and dry seasons, are home to tropical and subtropical dry broadleaf forests. Tropical and subtropical rainforests exist in the Amazon basin (the Amazon Rainforest), Nicaragua (Los Guatuzos, Bosawás and Indio-Maiz), the southern Yucatan peninsula-El Peten-Belize contiguous area of Central America (including the Calakmul Biosphere Reserve), in much of equatorial Africa from Cameroon to the Democratic Republic of Congo, in much of southeastern Asia from Myanmar to Indonesia and Papua New Guinea, eastern Queensland, Australia, and in some parts of the United States. About half of the world's tropical rainforests are in the South American countries of Brazil and Peru. Scientists estimate that more than half of all the world's plant and animal species live in tropical rain forests. While the Amazon Rainforest is largest in size, the Atlantica Rainforest near Rio de Janeiro, Brazil, which has been reduced in size by over 90 percent, still holds more biodiversity than the Amazon. Rainfall: high, year-round, sometimes with seasonal variation. Soil: generally poor and leached. There are several common characteristics of tropical trees. Tropical species frequently possess one or more of the following attributes not commonly seen in trees of higher latitudes. Many species have broad, woody flanges (buttresses) at the base of the trunk. Originally believed to help support the tree, now it is believed that the buttresses channel stem flow and its dissolved nutrients to the roots. Trees are often well connected in the canopy layer especially by the growth of woody climbers or lianas, plants with epiphytic adaptations, allowing them to grow on top of existing trees in the competition for sunlight. Large fleshy fruits that attract birds, mammals, and even fish as dispersal agents. The rainforest can be divided into four different parts, each with different plants and animals adapted for life in that particular area. This layer contains the emergents—trees that tower above the canopy. The trees are usually evergreens, which are able to withstand the harsh temperatures and high winds. Eagles, butterflies, and bats inhabit this layer. The densest areas of biodiversity are found in the forest canopy, a more or less continuous cover of foliage formed by adjacent treetops. The canopy, by some estimates, is home to 40 percent of all plant species, suggesting that perhaps half of all life on Earth could be found there. A quarter of all insect species are believed to exist in the rainforest canopy. Scientists have long suspected the richness of the canopy as a habitat, but have only recently developed practical methods of exploring it. As long ago as 1917, U.S. naturalist William Beebe declared that "another continent of life remains to be discovered, not upon the Earth, but one to two hundred feet above it, extending over thousands of square miles." True exploration of this habitat only began in the 1980s, when scientists developed methods to reach the canopy, such as firing ropes into the trees using crossbows. Exploration of the canopy is still in its infancy, but other methods include the use of balloons and airships to float above the highest branches, and the building of cranes and walkways planted on the forest floor. There is a space between the canopy and the forest floor, which is known as the understorey (or understory). This is home to a number of birds, monkeys, snakes, and lizards. The leaves are much larger at this level. Insect life is also abundant. Away from river banks, swamps, and clearings where dense undergrowth is found, the forest floor is relatively clear of vegetation, as little sunlight penetrates to ground level. This region receives only 2 percent of the rainforest's sunlight. Thus, only specially adapted plants can grow in this region. It also contains decaying plant and animal matter, which disappears quickly due to the lack of sunlight. It is commonly believed, erroneously, that one of the key values of rainforests is that they provide much of the oxygen for the planet. However, most rainforests do not in fact provide much net oxygen for the rest of the world. Through factors such as the decomposition of dead plant matter, rainforests consume as much oxygen as they produce, except in certain conditions (primarily swamp forests) where the dead plant matter does not decay, but is preserved underground instead (ultimately to form new coal deposits over enough time). However, rainforests do act as major consumers of atmospheric carbon dioxide and may play a large role in cooling air that passes through them. As such, many scientists feel that the rainforests are of vital importance within the global climate system. Being integral to the water cycle, if a rainforest is cleared, droughts increase and the area may become desert. Rainforests are also major sources of biodiversity. Estimates of the percent of the world's species found in rainforests range from 50 percent to even 90 percent. Rainforests provide a number of foods for people, including cocoa, coffee, fruits, nuts, and spices, as well as products such as rubber, tannins, resins, and gums. Rainforest soils tend to be poor, due to leaching of the minerals by the high rainfall. Rainforests help to conserve water by soaking up the moisture, acting like a sponge and decreasing the risk of flooding. They also quickly recycle nutrients, utilizing shallow roots. With the extensive roots, erosion is also decreased. Tropical rain forests are called the “world's largest pharmacy” because of the large amount of natural medicines discovered there. Many of the medicines that humans use come from the rainforests. Currently, over 120 prescription drugs sold worldwide come from plant-derived sources, including one quarter of Western pharmaceuticals that are specifically derived from rainforest plants. The U.S. National Cancer Institute has identified 3,000 plants that are active against cancer cells. Seventy percent of these cancer-fighting plants are found in the rainforest. Today, there are over 100 pharmaceutical companies and several government agencies researching plants from the rainforest for possible cures for AIDS, cancer, and other diseases. Tropical and temperate rainforests have been subjected to heavy logging and agricultural clearance throughout the twentieth century, and the area covered by rainforests around the world is rapidly shrinking. It is estimated that the rainforest was reduced by about 58,000 square kilometers annually in the 1990s, and may be decreasing by one and one-half acres of rainforest every second. Such extensive loss of rainforest can be tragic for both developing and developed nations alike. Humanity is losing potential medicines, food, products, climate and flood protection, and biodiversity. As much as one half of the world’s plants, animals, and microorganisms may be lost if the trends of degradation to the rainforest continue unchecked in the next quarter of a century. Some biologists have estimated that large numbers of species are being driven to extinction, possibly as much as 50,000 a year (or 137 species lost per day), due to the removal of habitat with destruction of the rainforests. Protection and regeneration of the rainforests is a key goal of many environmental charities and organizations, including the Rainforest Alliance and the Nature Conservancy. Tropical and subtropical rainforests rarely go above 93° F or below 68° F.
Seventy percent of the plants in the rainforests are trees. Many rainforest trees grow straight for 100 feet then branch out. Over 2,500 types of vines grow in the rainforests. A 25-acre plot of rainforest in Borneo may contain more than 700 species of trees—a number equal to the total tree diversity of North America. A single rainforest reserve in Peru is home to more species of birds than are found in the entire United States. One single tree in Peru was found to harbor 43 different species of ants—a total that approximates the entire number of ant species in the British Isles. At least 80 percent of the developed world's diet originated in the tropical rainforest. Its bountiful gifts to the world include fruits like avocados, coconuts, figs, oranges, lemons, grapefruit, bananas, guavas, pineapples, mangos, and tomatoes; vegetables including corn, potatoes, rice, winter squash and yams; spices like black pepper, cayenne, chocolate, cinnamon, cloves, ginger, sugar cane, tumeric, coffee, vanilla, and nuts, including Brazil nuts and cashews. At least 3,000 fruits are found in the rainforests; of these only 200 are now in use in the Western world. The Indians of the rainforest use over 2,000. This page was last modified on 29 August 2008, at 15:22.